I enjoyed a nice ride today, despite temps in the 40s. It was slow, low-key, and scenic. Thanks to friend Stephen passing some winter riding gear my way I was toasty, comfy and blissfully happy out on my bike. I love this pink and blue jersey, I think it's my new favorite! 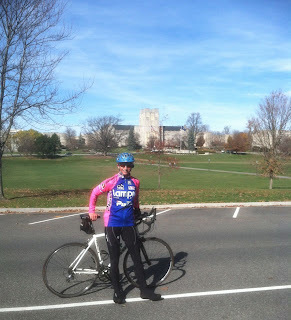 In this picture I had just circled the Drillfield which is the central part of our campus here at Virginia Tech. Behind me is Burruss Hall, the main administrative building. On my ride I was thinking about my experience with "adult onset athleticism" and how at age 44 I don't believe I have hit my peak. (Even if I have, I'll never let myself think that way.) The thing is....we old people learn to use "smarts" to eek every bit out of ourselves that we can. I think we can offset natural decreases in speed just by getting smarter about training and racing. The late bloomers like me can push the peak speed years well into our 40's. My friend Erik, at age 43, just ran a 1:28 half marathon today on reduced mileage and lower running frequency but he's added in strength training. He's finding ways to add more smarts into his regimen and it's paying off. Personally, my own smarts only take me so far. I rely on the smarts of my coach and trainer for the biggest boosts. 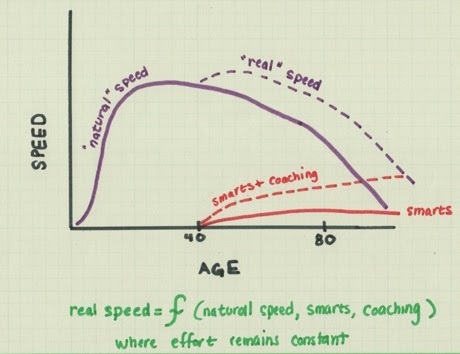 Correction: real speed is a function of AGE, natural speed, smarts, and coaching. I love working on the "smarts" part of the equation - learning more about swim/bike/run/lift, my own mental approach, and how best to manage this body. One way to work on the smarts is with the training videos produced by my sponsors, Endurance Films. I have a bunch that I've watched and need to get some reviews up because they've been quite good. EF recently put up the nicest blog post about An Attitude of Gratitude. How often does a sponsor say thanks to the athletes they sponsor?? The guys who run EF, Eric and Danny, are some of the hardest working, most genuine folks I have come across. I'm really honored to have a small part of it all and I believe strongly in their products. 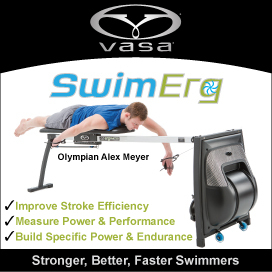 So if you are looking for some cool gift ideas for your favorite triathlete or runner....look no further!! Our town, Blacksburg, Virginia, was named Best Place in the US to Raise Kids by Business Week! I don't put a lot of stock in those lists, but I do have to say it's a pretty cool place and we are very happy to live here. What determines our running speed?